Last weekend, my parents-in-law (PIL) gave me a big sieve, a cake pan & a cane "basket" for baking. It all started when we discuss about steaming "ji dan gao". So since they have stopped baking long ago, they decided to give me their "inheritence" so as not to go waste. For me of course I'll gladly accept. Anything to do with baking, I'll be glad to be "garbage" collector! 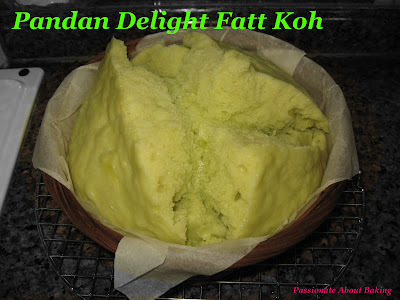 I remembered I had a recipe of the Pandan Delight Fatt Koh from Yochana. So I decided to steam this tonight, so that I can give my PIL tomorrow when they drop by. I had a packet of HK flour which I didn't use since the last time I made pao! This recipe was pretty easy and nice. 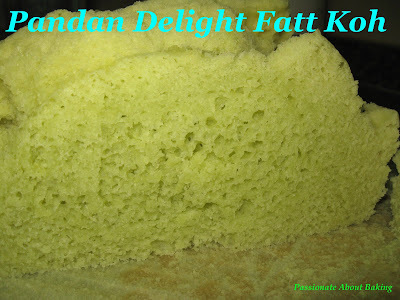 I hesitated for quite a while, don't know if I should use muffin trays for smaller Fatt Koh or the cane basket. Finally, I decided to use the cane basket. I lined it with baking paper, and steam it in the wok. It took much longer than what is in the recipe because mine was a big basket, about 7". However, I was very happy with the result when I opened the wok cover! My Fatt Koh "smiled" at me!! Yippee!! But I steamed until my wok was dry, lucky it was ready!! The nice green was from the pandan leaves. There was no colouring added. 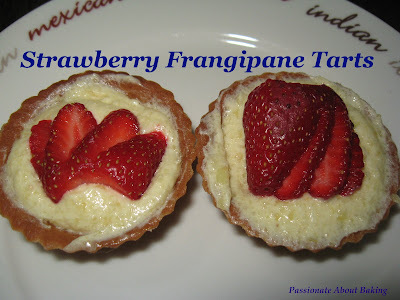 While waiting for my Fatt Koh to proof, I did up the Almond Cream or Frangipane for my Strawberry Tarts. Baked the tart crusts last weekend, but haven't filled them up yet. I wanted to fill them up so that I can finish them. I filled them with frangipane, and had Strawberry Frangipane Tarts! I've not tried Fatt Koh before and it's quite new things for me. It seems like a very soft bread or chiffon cake. I want to try this recipe soon. Thanks for sharing! 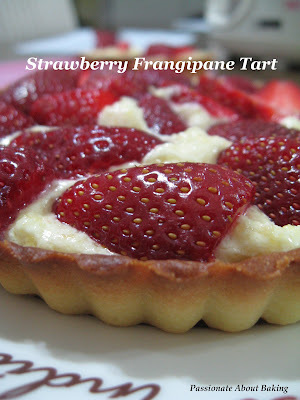 Your strawberry tart looks perfect! It's been sucha long time since I baked fruit tarts, but I always find it difficult to get the edges so neatly trimmed :( Any tips? I thought most Chinese will know about "fatt koh" or 发糕? It's soft after steaming, but will turn tough after that. I think 鸡蛋糕 will stay soft throughout. My tarts also half half only. :p I just push it against the tart pan, and when it's baked, it just formed the shape. When I put the dough, I'll pressed it tightly against the sides, and level the top. That's all I did. Maybe you can try it? I hope it's useful.